Daniella and Elliot Crowder, owners of the Bike Newport bike shop, unveiled their plans for a new iPhone app today. 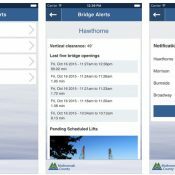 The new ‘Cycling the Oregon Coast’ app is currently in beta form and is set to be released soon (Android platform will come later). The announcement of the new app came at a meeting of the Oregon Bicycle Tourism Partnership held in Salem this morning. 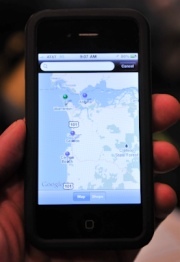 According to Elliot Crowder, he was inspired to create an app after taking a bike tour on the Oregon Coast recently. Like the thousands of other people who ride the famous Oregon Coast Bike Route each year, Crowder relied on the popular Cycling the Pacific Coast guidebook. Trouble is, the book is out of date. The app will be free and will include a list of all the bike shops, hiker/biker campsites, brew pubs, and grocery stores on the Coast. When a user clicks on one of those resources, they’ll be taken to a map of its location and full contact information. Elliot Crowder says they’re on track to release the iPhone version of the app in May. Bike Newport is a bike shop based in the coastal town of Newport that has become a hub for the estimated 6,000 to 10,000 bike tourists that ride the Oregon Coast Bike Route each year. Last year, Bike Newport won a National Bicycle Travel Award from the Adventure Cycling Association. Neat. Personally, I found using the guide/map from ODOT to be really easy though. I hope the app really highlights the non 101 sections, which can look like diversions but are almost always great choices. Bad link. Bike Newport is at http://www.bikenewport.net/ not .com.